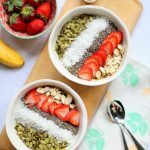 This recipe for High Protein Hemp Oatmeal is a dairy-free protein-packed breakfast dish that comes together quickly on a busy morning. With 14 grams of protein and 14 grams of fiber per serving it’s a delicious morning meal that will keep you full for hours. Combine all ingredients in a medium-size pot. Heat over medium-high heat and stir regularly (don’t walk away!) for 10-12 minutes until milk is completely absorbed and the oatmeal appears thick and fluffy. Divide oats into serving bowls and top with desired toppings. Refrigerate any leftovers in an air-tight container.